"Amy is fine living in the shadows of beautiful Lila and uber-cool Cassie, because at least she’s somewhat beautiful and uber-cool by association. But when their dates stand them up for prom, and the girls take matters into their own hands—earning them a night in jail outfitted in satin, stilettos, and Spanx—Amy discovers even a prom spent in handcuffs might be better than the humiliating “rehabilitation techniques” now filling up her summer. Worse, with Lila and Cassie parentally banned, Amy feels like she has nothing—like she is nothing. Navigating unlikely alliances with her new coworker, two very different boys, and possibly even her parents, Amy struggles to decide if it’s worth being a best friend when it makes you a public enemy. Bringing readers along on an often hilarious and heartwarming journey, Amy finds that maybe getting a life only happens once you think your life is over." This book was definitely different from what I was expecting. I thought it'd be a light fun read about some prom night shenanigans and consequences, but was surprised to read about something much deeper. Amy is one lost girl trying to find her way through life and high school. She struggles with a lot of teen issues and goes through a journey of self-discovery throughout the book. 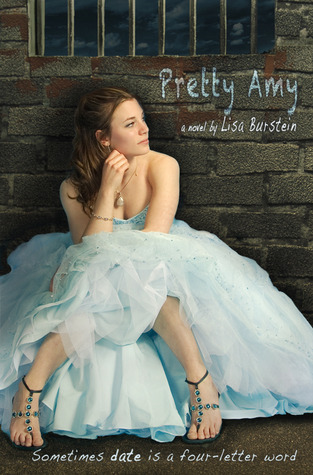 Lisa Burstein puts readers in Amy's shoes in a way that is entertaining and heartbreaking all at once. Burstein definitely has the whole teenage angst voice down throughout this book. Though the book deals with a few serious topics, I really loved Amy's snarky attitude in the beginning of the book. My only wish is that it continued throughout the book. I wasn't one to relate to Amy's character, but I did definitely feel for her. I think everyone can relate to the feeling of being lost, but I had a hard time relating to Amy's rather low self-esteem. I understood how she was able to get to that point, but I personally felt it was a bit overboard. I truly did want to root for Amy, but I just couldn't. Sure, I felt for her problems but she was so "woe is me" all through the book that it was sort of tiring. This is vastly due to the Amy's friends. I just couldn't understand why Amy would stay around friends like Lila and Cassie. As a person wanting to be noticed, I just didn't see how her friends solved that problem. Amy's parents were a major highlight for me because they were crazy! Wait, I take that back; her mother was crazy. However, I liked that I really did feel for her parents because I could tell they did truly care even if they didn't show it in the best of ways. Though some scenes were a bit extreme at times, they were also fairly believable for someone's life that has taken a wrong turn. Though I liked Amy as a character, the one thing that kept bugging me as I read was her slight touch of superiority towards others. I kind of felt like she looked down upon people around her and that just didn't fit well with her character for me. I get that people judge others, but for a girl who has very little going for her in life, I didn't feel like she should have a lot of room to talk or think about others the way she was. Overall, Pretty Amy is a pretty engaging read for people in and out of their high school years. Discovering life through Amy's actions is a fun read many will enjoy. Burstein shows exactly what it feels like to be a teenager when they need to decide to grow and face the world around them. If you like seeing true inner struggle in a character, then this book is for you. Thanks to Entangled Publishing and NetGalley for providing me a copy!